This started out as two posts: Outwintering, and Slow-draining Soils. There is much to say about both. But because these two subjects are, right now, my greatest challenge, and so interconnected and related, I could not separate them. So let me begin. Until such time as I am able to achieve the ultimate in managed grazing, which is to have stockpiled forage to rotationally graze as much as possible throughout the calendar year, I will have to feed hay during some or all of the winter months. This grazing year was a complete anomaly, starting late with a hungry, starving herd of animals on summer stockpiled pastures and doing my best to make the forage last as long as I could, without compromising either herd health or pasture condition. I was able to utilize every acre of stockpiled growth, and move the cow herd back through about 15 acres of regrown pasture before the growing season ended, grasses went dormant and I deemed it time to stop grazing around the end of October and leave what cover remained to protect the soil until Spring. Without a loafing shed or permanent feeding area set up yet, and limited areas suitable in terms of slope, wind protection and vehicle access to outwinter the herd, I picked several spots to set up as “sacrifice” paddocks this winter. They’ll get way more than their share of manure and hoof impact and will need some serious renovation come spring, but I believe it is better to do that to a relatively small area than visit serious damage far and wide. 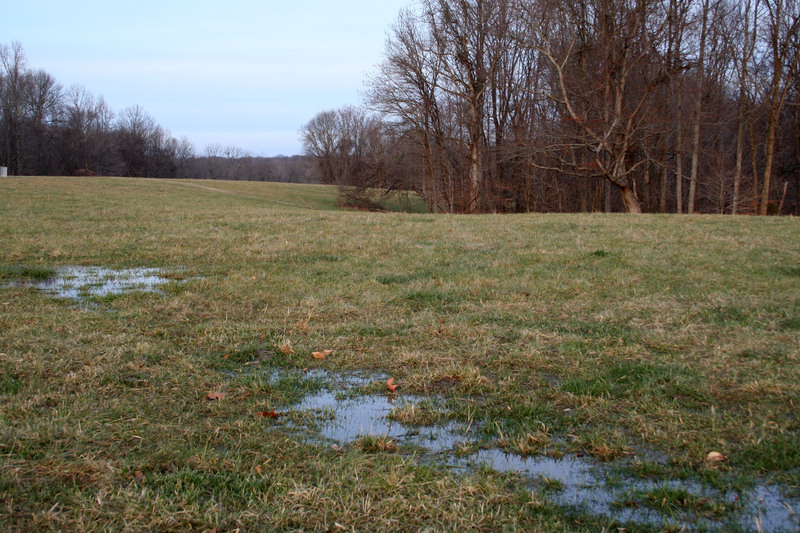 I knew from my limited periods of observation during short working visits to the Farm in previous winters that there were areas in the central part of the pasture that held standing water after a rain event, and drained slowly over a period of several days. I also knew from having performed soil quality tests, that my pastures are a clayey loam, with not a lot of organic matter, and the root profile of the sod does not penetrate very deeply. Knowing that the pastures were reclaimed from invading forest by bulldozer some 25 years ago and had been seeded and maintained as tractor-mown meadows without animal impact since then, I also accepted the fact that the topsoil was probably thin, mixed with subsoil, and compacted. So, when I went to set up my winter paddocks I skirted what I had identified as the low, wet area between the two ponds, and fenced the highest summit-like areas, maximizing proximity and orientation to forest edges for shelter from the west/northwest winds. Feeding cows round bales of hay in ring feeders set in open fields is standard outwintering practice in these parts. Most feeding areas I’ve seen on neighboring farms are not even on high ground. I thought my carefully-chosen locations would work very well. And they did, for a few weeks, until the December rains came and saturated even the highest spots. Dormant grasses don’t move water. Two inches of rain in two weeks is not absorbed or utilized the same way in December as two inches of rain in, say, September, even on the best soils. And my clay soils hug water like they never want to let it go. The cows and a small area of soil around the failed feeding areas suffered for a week or so until I came to my senses and realized the pugging damage and ankle-deep manure/mud was not worth the convenience of having them self-feed out of a ring feeder. I won’t post a picture of the destructive impact caused by eight full-grown cows around a ring feeder on wet, slow-draining soil. Trust me, it’s ugly. It made me sick to my stomach to see, and I wracked my brain trying to figure out first how to prevent it, then second, how to mitigate the muck once they had stomped through the sod and worked the area into 8″ of sloppy mud. Finally, the light bulb came on, and I realized what a losing proposition those ring feeders are on unfrozen ground in this climate. At least, for a farmer like me. I know what happens to soil structure when it is churned into mud, and it’s the exact opposite of what I’m trying to accomplish on these pastures. And the cows aren’t the only problem – driving the tractor in to fork another bale in makes mud ruts in a hurry, too. I was trying to limit the tractor moves to below-freezing mornings when the ground was stiff and frozen, but the timing didn’t always work out. So, I am hand feeding now, forking the hay off the rolls, which are set on end in a staging area, into the dump bed of my little 4×6 Gator and delivering it, gently, to the paddocks. And it is better, much better. I can move the piles around which distributes not only the hoof impact, but the leftover hay that becomes trampled-in carbon to feed the soil. With the Gator I can haul and dump huge piles of hay in just a few minutes, and fork out the excess manure pats to stockpile in next year’s garden area. It is more hand work. It takes more time. But the ladies are eating better, I’m able to keep a closer eye on their condition with the twice-daily interaction, and best of all, the pasture area they are feeding on now looks excellent. The sod is somewhat trampled, but not broken. 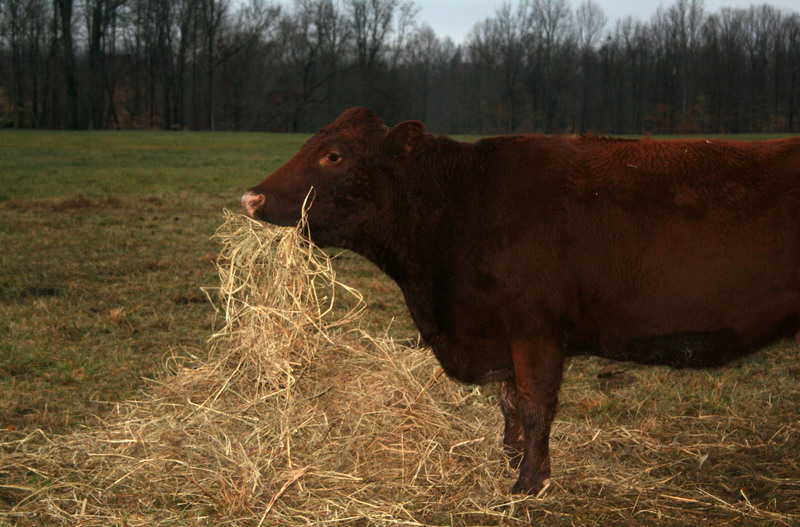 Next year I hope to graze a little longer into the winter, but I’ll still need a winter hay feeding strategy. I think for the long-term an idea like this permanent central feeding station that would integrate with pasture rotations would be ideal. It’s a matter of finding the right location, as it is quite permanent; but it could also be roofed and serve as shade and a rainwater collection point. Not something that can be thrown together at the last minute but certainly worth planning for. Meanwhile, the cows have learned the new feeding routine and don’t seem to miss the mud. And I sleep better at night. It never ceases to amaze me just how much planning and care and nitpicking little details go into the mundane and routine. Your situation is so dependant upon the quality of the soil, the history of the farm, the amount of rain, etc. It is clear that there is no one size fits all answer and just how damaging those types of methods can be when applied to industrial sized farming and ranching enterprises. There is a correlation with the old term “salt of the earth” often used when referring to small independant farmers. Salt is made of many grains, many individuals and each must find the best solution of sitting as easily upon the land as possible. Ah, very well said! I especially like the reference to salt of the earth… yes you would think feeding a small herd of cows would be like falling off a log. It is not. It isn’t rocket science, but it is husbandry, of both the animals and the land they are on, and to do it well requires a lot of thought and creativity and the ability to adapt to changing conditions. Thanks for your thoughtful response!